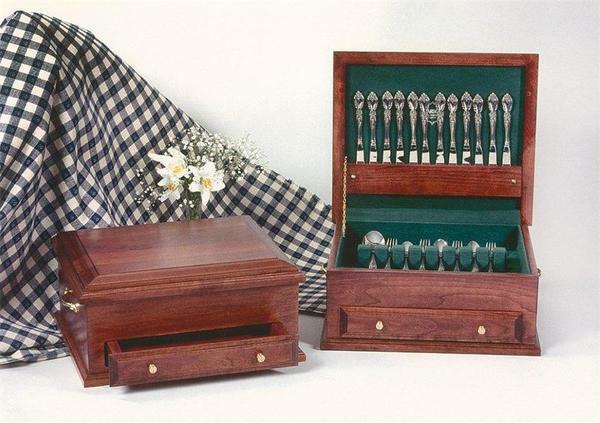 Holds 12 Place Settings This well-detailed Amish Silverware Chest securely stores all of your silverware in one location. This Amish Silverware Chest is available with customer's choice of hunter green or burgundy anti-tarnish Guardian cloth. DutchCrafters Amish Made Silverware Chest holds up to 12 place settings of flatware with space for serving spoons, salad forks, tea spoons and ladles. Amish Silverware Chests and Amish Flatware Chests are a great wedding gift or anniversary gift!